Heather was raised by an artist and grew up surrounded by art and antiques. After beginning her design career as a founding partner in Pentimento Interiors, she launched Heather Vaughan Design in 2007 with a focus on bespoke interior design. Heather is a creative, energetic problem-solver with excellent listening skills. She and her team bring a spirit of collaboration to every design project they undertake. They have close, lasting relationships with the artisans who produce the one of a kind pieces that are so iconic to her work. More than that, the team’s abiding mission is to partner with clients to co-create beautiful and timeless spaces. At Heather Vaughan Design, we collaborate with clients to create spaces they long to return to; homes that comfort, restore, and reflect the individuality and soul of the owner. Never settling for ordinary, we strive to design extraordinary spaces that are inspired by the people who inhabit them. Aware that each client is unique, we approach every project with a bespoke point of view and design homes that are personal and in sync with our client’s lifestyle and needs. We specialize in sophisticated layering of materials and finishes, pattern and texture combination, artful use of color, as well as an ability to design and create one of a kind elements. “Bespoke Design” is really our specialty. 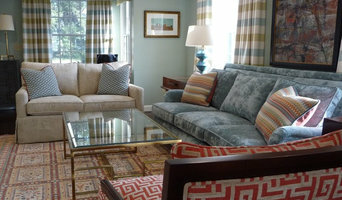 We excel at custom creating ‘one-offs’ furniture, lighting, and even wall coverings and fabrics. We collaborate with a diverse group of artisans and trade professionals locally, nationally, and internationally. At Heather Vaughan Design, we believe that successful projects are built on a foundation of trust and good communication. We listen to our clients and support and encourage them to trust their own instinct and voice. Boston Architect & Designer | 3x Best of Houzz Award Winner! Liz Caan & Co. is a full-service interior design firm specializing in creative transformations that honor tradition with a modern sensibility. The firm’s collaborative design approach engages clients in a creative process that helps them think beyond the expected. The result is a beautiful and functional home that is highly attuned to the owners’ lifestyle, personality and values. Liz Caan & Co. has been showcased in numerous publications, including Traditional Home, Luxe Interiors, Better Homes & Gardens, HGTV Magazine, Design New England, Boston Home, The Boston Globe, Boston Common, and New England Home. Their work has also been featured in the book, Linens: For Every Room and Occasion by Jane Scott Hodges and the book, Decorating with Carpets by Ashley Stark Kenner and Chad Stark. *Hunter Douglas Authorized Dealer* Ever since I can remember I've loved sewing and taking on creative projects. As an adult, I began designing window treatments for family and friends. And in 1995, with the inspiration to continue doing what I loved, the support of satisfied clients and a solid business plan, I founded KH Window Fashions, Inc. My philosophy is simple and based on my early success designing for family and friends. I realized the value and key to my success was truly knowing and understanding my client. I knew their style and what they envisioned and I understood how to incorporate my design ideas with their personal and sentimental accents. The result in each case has been beautiful custom designed interiors that complement their lifestyle. My design talents are proven, and I have worked hard to earn the interior design credentials that allow me to introduce myself to you with industry recognition, professional certifications and industry resources needed to deliver custom design services, brand products and expert craftsmanship. With you in mind, I'll make the custom selections available to me as a professional interior designer and bring you design choices in answer to your style- all from the comfort of your home. KH Window Fashions, Inc. is founded on the belief that good design starts with good relationships. By your invitation I'll get to know you with the same respect and understanding as given my early clients- and you'll soon be surrounded by the décor that is uniquely you.